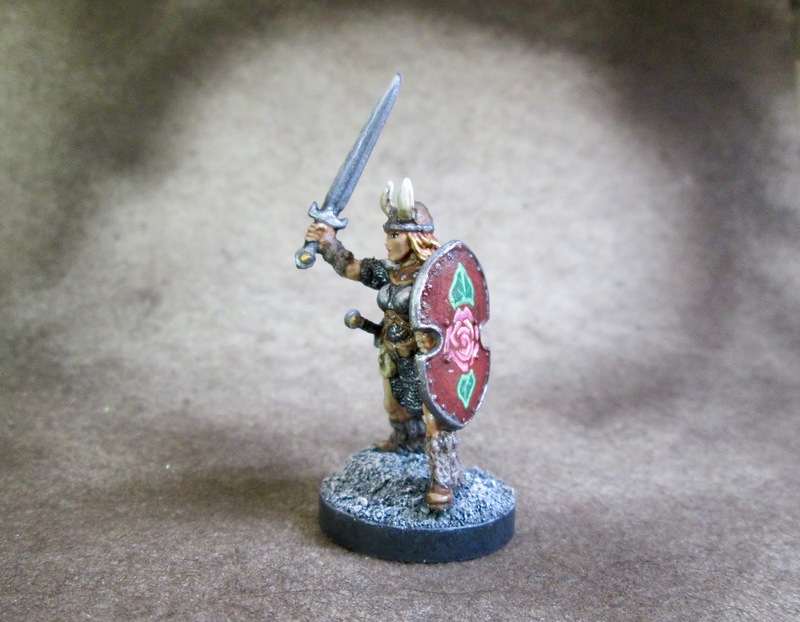 Ingrid, Female Viking: Bones 2 Figure | H.A.W.K.S. 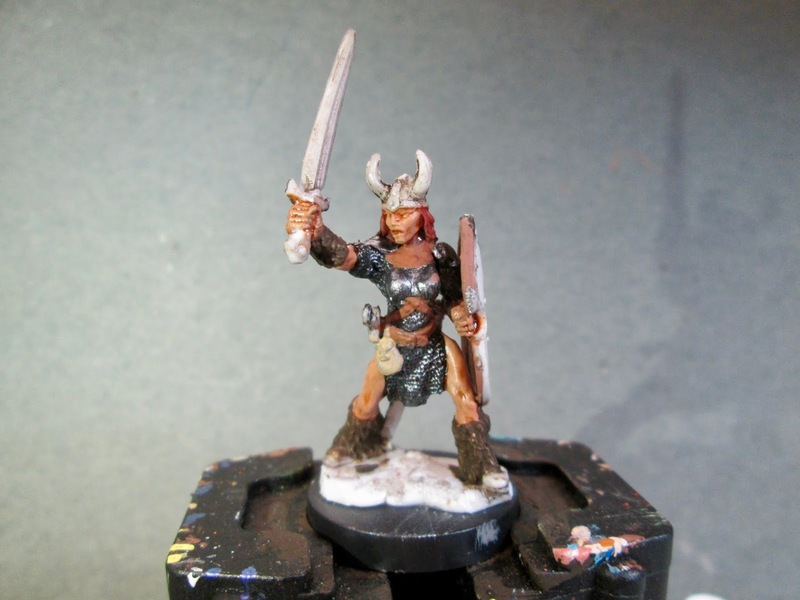 A couple weeks ago I started painting Ingrid, Female Viking, from the Bones 2, Heroes I set; and this week I finally finished her. 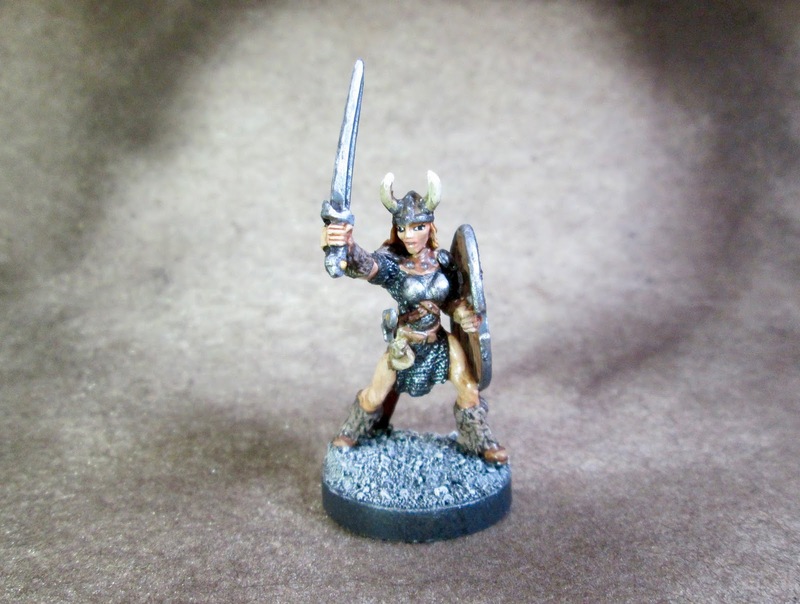 I don’t have a need for this figure, so I thought I’d just paint her up to put on eBay, and help bring a little money back into the hobby fund. 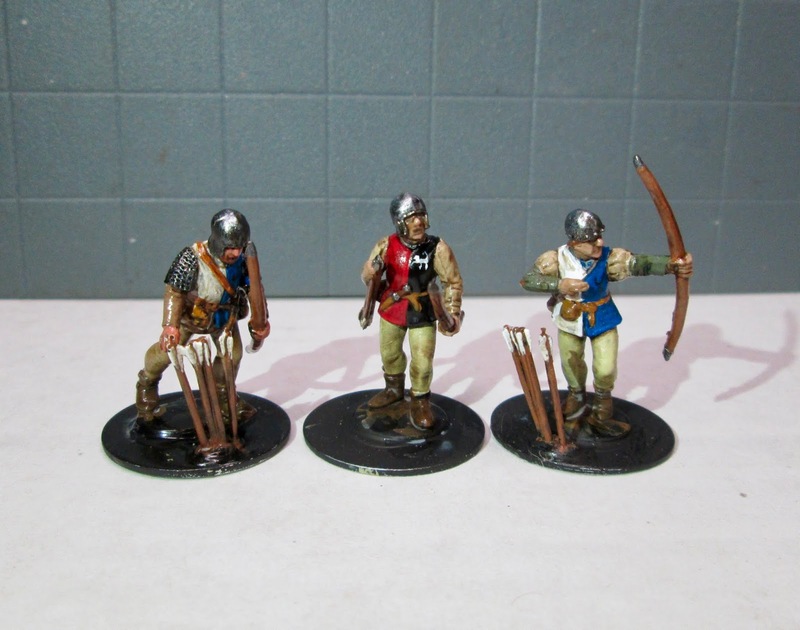 Also, before I get into Bones painting today, I wanted to update folks on another of the projects I mentioned in last Monday’s post: the Perry plastic War of the Roses figures. 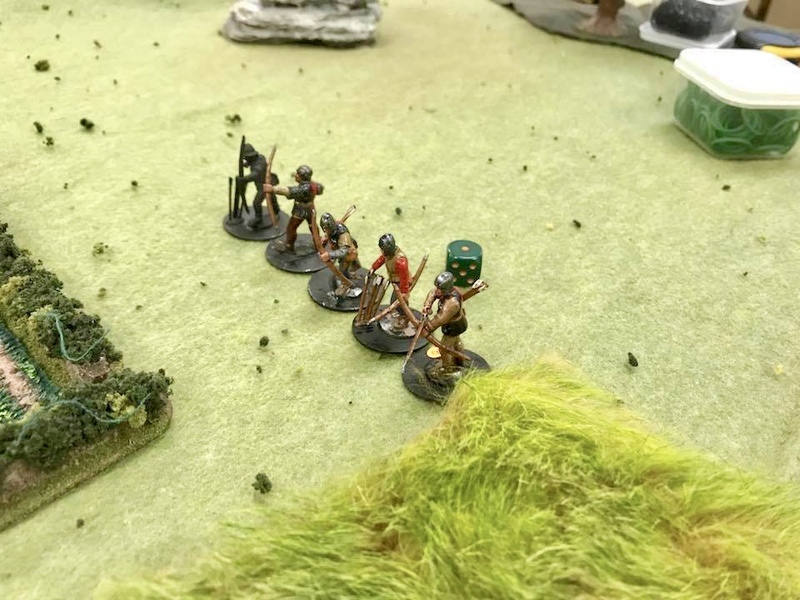 To help add the pressure to that project, I volunteered to run a playtest with the figures at last Friday’s club meeting, and attempted to get all 40 figures done in about 6 days. Well, I did pretty good in my goal, and got 28 of them done in time for the game! 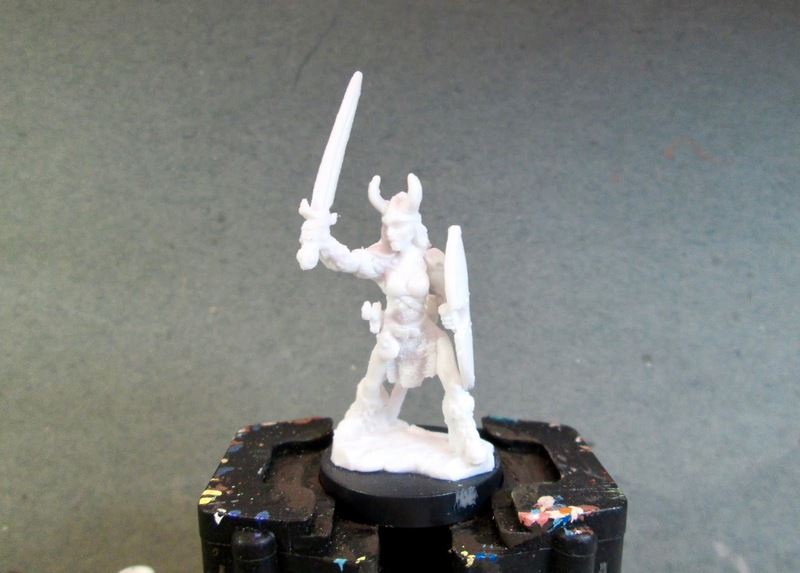 They aren’t up to the standard you usually see here, but they are good for a tabletop standard. So, I’m not worried now that I will have all of them ready by the end of September. What I can accomplish working only 25-30 minutes per figure. I began working on Ingrid by prepping this figure in the usual way; soaking it in a dish of water with a couple drops of dish-soap added, then giving it a light scrub with a soft toothbrush, and then rinsing and drying it. When dry, I glued the figure to a 1" Reaper plastic base with Gorilla Superglue. I then placed the figure in my painting grip. I began by giving the figure a wash with Reaper MSP “Brown Liner”; and when that was dry, I painted her armor with Ceramcoat “Black”. When dry, I drybrushed the armor with Folk Art Metallics “Gunmetal Grey”. I then painted her skin with Reaper MSP “Tanned Skin”. 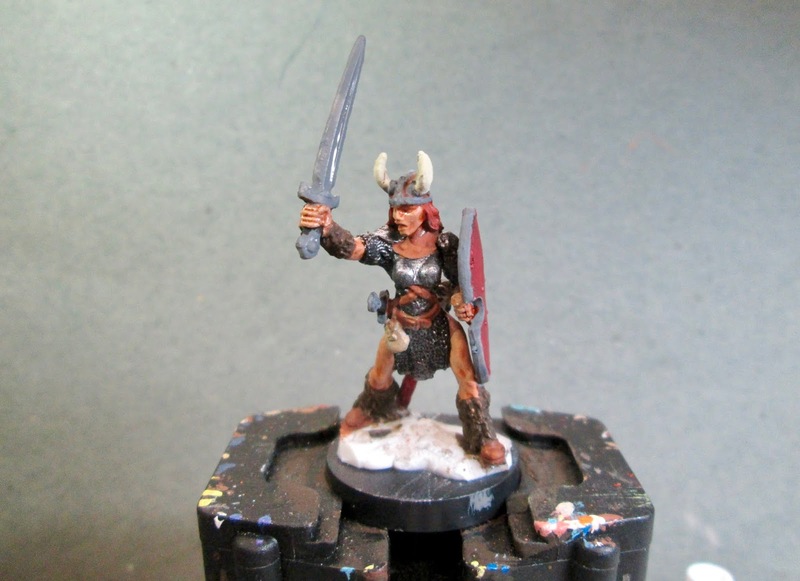 Next, I gave her skin a wash with Citadel “Reikland Fleshshade”. When it was dry, I painted the fur part of her boots and her forearm guards with Americana “Bittersweet Chocolate”, and the leather parts of her armor and belts with Crafter’s Edition “Spice Brown”. I then painted the wood back of her shield with Folk Art “Teddy Bear Brown”, and her pouch with Americana “Khaki Tan”. After that, I painted her hair with Anita’s “Burnt Sienna”. I then painted her helmet, dagger sheath, and the non-furry part of her boots with Crafter’s acrylic “Cinnamon Brown”, and the horns on her hemet with Folk Art “Porcelain White”. After that, I painted her shield and sword scabbard with Ceramcoat “Black Cherry”, and then painted all the metal bits that weren’t armor, with Americana “Zinc”. 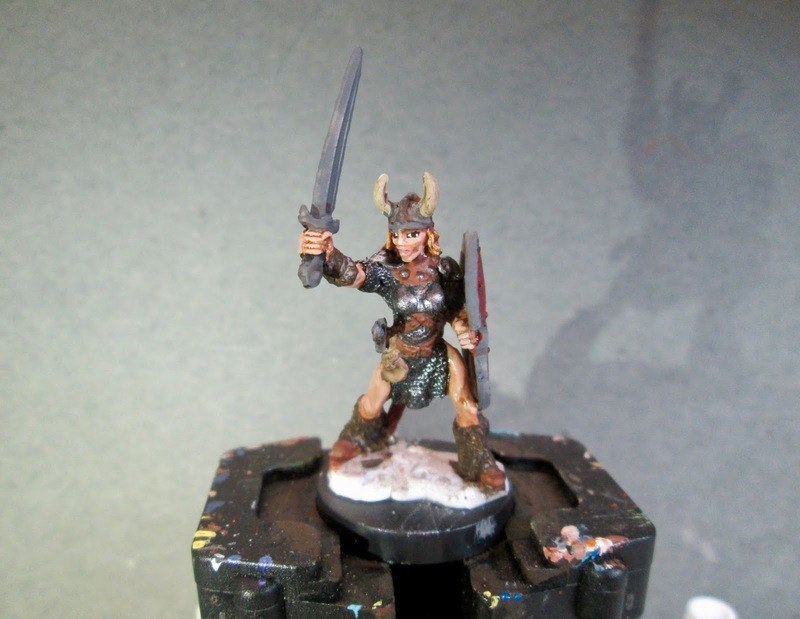 When everything was dry, I gave a wash to her clothes, shield, hair, and weapons; being careful to avoid her skin and armor, using Citadel “Agrax Earthshade” wash. When the wash was dry, I painted her eyes and lips, and then highlighted her skin with Reaper MSP “Tanned Highlight”. After that, I highlighted her hair with Americana “Terra Cotta”, then Accent “Golden Oxide”, then Ceramcoat “Maple Sugar Tan”. I then painted the studs on her leather neck piece, using the “Gunmetal Grey”. When that was dry, I gave it a little wash with some Citadel “Nuln Oil” wash to help the studs stand out. 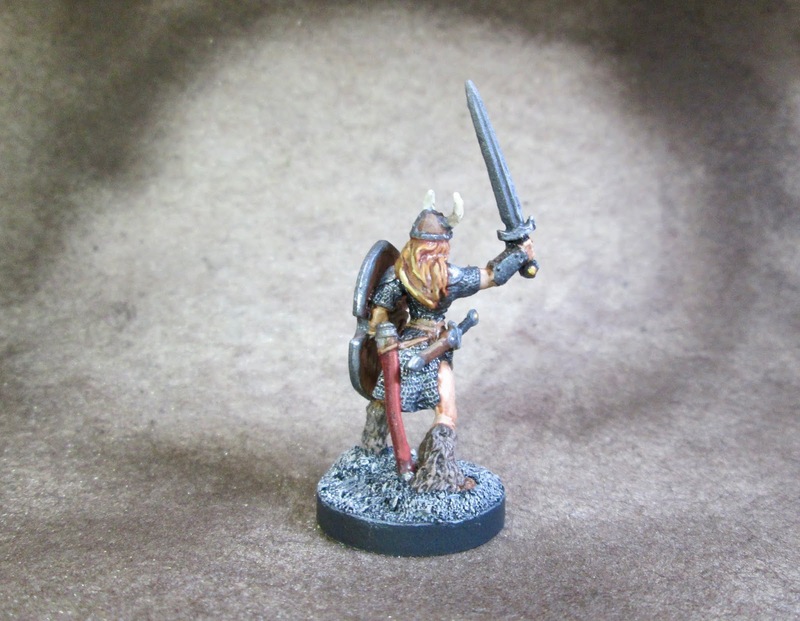 When the “Nuln Oil” was dry, I highlighted all the leather bits with Americana “Sable Brown”. I then highlighted the fur part of the boots and the forearm guard fur with with Americana “Mississippi Mud”, and then highlighted her shoes, dagger sheath, and the non metallic parts of her helmet, with Ceramcoat “Territorial Beige”. Next, I highlighted the pouch with Americana “Antique White”,and the shield with Reaper MSP Bones “Cinnamon Red”. I then went back and repainted all the parts I had painted with the “Zinc”, and all the little studs on her straps and shield, using the “Gunmetal Grey”. 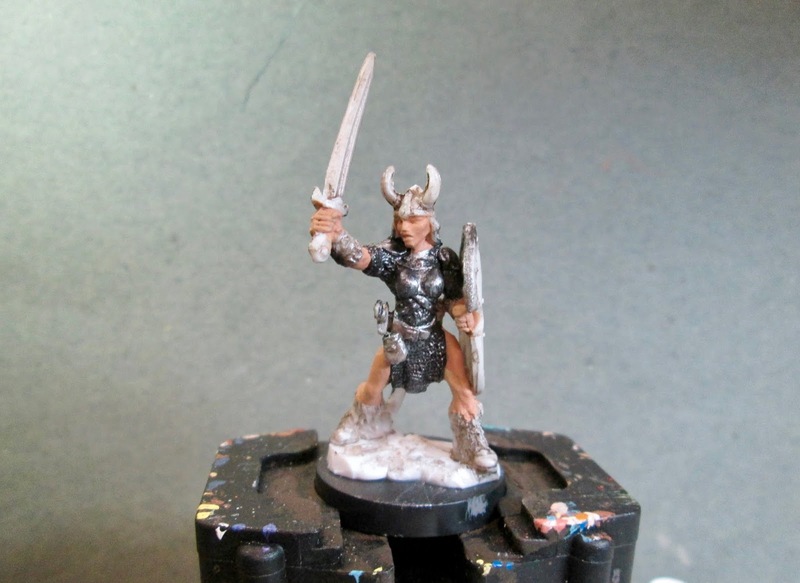 When dry, I went back again, and highlighted all the metal, including her armor, with Ceramcoat “Metallic Silver”. After that, I painted the circular medallion on her sword and dagger hilts with Ceramcoat “Bronze”, and then went back and highlighted them with Ceramcoat “Wedding Gold”. I then debated how to decorate the shield, and decided I wanted to do something feminine, to contrast with her barbarian nature. So, I thought about what would be within my abilities to paint, and I decided on a stylized rose, as it would go well with the dark red shield I thought. So I did a Google image search for “Rose Graphic” and got some inspiration for how to proceed. I began by painting the petals with Crafter’s Acrylic “Tutti Frutti”, and then painted the leaves with Americana “Forest Green” . I then went back and highlighted the petals with Crafter’s acrylic “Cherry Blossom Pink” and highlighted the leaves with Crafter’s Acrylic “Wild Green”. Lastly, I painted the figure’s integral base with the “Black”. I let the figure dry overnight and the next day I gave it a coat of Americana “DuraClear Matte” varnish. When the varnish was dry, I used some white glue to glue a little sand to the base. When this was dry, I painted the sand with the Black and, when dry, drybrushed the base with some Americana “Zinc”, followed by Crafter’s Acrylic “Light Storm Cloud Grey”, and lastly some Americana “Dove Grey”. Then, another overnight dry, and I sprayed it with Testor’s Dullcote". Very nice, I also like how the helmet turned out!